Radio broadcasting from strategically located sites across the country. VIVACOM owns a unique nationwide radio broadcasting network, which encompasses nearly 100 sites for FM broadcasting. The location of the sites have been specifically chosen for the purpose of maximum coverage. Some of the major customers of the service are Bulgarian National Radio, Darik Radio, Communicorp, BSS, Bolkan Broadcasting, Focus, as well as many other private radio stations. Some of the major customers of the service are Bulgarian National Radio, Darik Radio, Communicorp, BSS, Balkan Broadcasting, bTV radio, Focus, as well as many other private radio stations. VIVACOM provides FM coverage for 95% of the population of Bulgaria with the national program “Horizont” of Bulgarian National Radio. The company is constantly investing in the development of the networks of Bulgarian National Radio and all other private radio stations using the services of the company. The FM antennas have been changed from horizontal to vertical polarization – in accordance with the requirements of Communications Regulation Commission in Bulgaria. The transmitters are being constantly upgraded and replaced with brand new SSPA transmitters with power up to 10 kW. 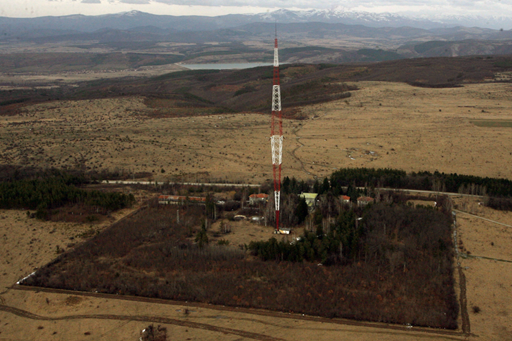 In 2013 the company successfully put into operation a brand new state-of-the-art MW transmitter for the main program of Bulgarian National Radio. The transmitter is broadcasting “on 576 kHz for areas without FM coverage in the country.